Our ancestors were making stone tools even earlier than we thought—some 700,000 years older. That’s the finding of the West Turkana Archaeological Project (WTAP) team—co-led by Stony Brook University’s Drs. Sonia Harmand and Jason Lewis—who have found the earliest stone artifacts, dating to 3.3 million years ago, at a site named Lomekwi 3 on the western shore of Lake Turkana in northern Kenya. 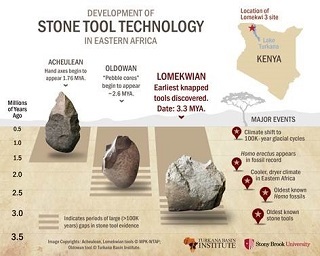 The discovery was announced in a paper, 3.3-million-year-old stone tools from Lomekwi 3, West Turkana, Kenya, published on May 21 in Nature. Dr. Harmand, the lead author, says that the Lomekwi 3 artifacts show that at least one group of ancient hominin started intentionally “knapping” stones—breaking off pieces with quick, hard strikes from another stone—to make sharp tools long before previously thought. In the 1930s, paleoanthropologists Louis and Mary Leakey unearthed early stone artifacts at Olduvai Gorge in Tanzania and named them the Oldowan tool culture. In the 1960s they found hominin fossils (in association with those Oldowan tools) that looked more like later humans—and assigned them to a new species, Homo habilis, handy man. But a series of papers published in early 2015 have solidified an emerging paradigm shift in paleoanthropology—Australopithecus africanus and other Pleistocene hominins, traditionally considered not to have made stone tools, have a human-like trabecular bone pattern in their hand bones consistent with stone tool knapping and use. Credit getting lost for the find. One day in the field, Drs. Harmand and Lewis and their team accidently followed the wrong dry riverbed—the only way of navigating these remote desert badlands—and were scanning the landscape for a way back to the main channel. Local Turkana tribesman Sammy Lokorodi helped them spot the stone tools. The study of the Lomekwi 3 artifacts suggest they could represent a transitional technological stage—a missing link—between the pounding-oriented stone tool use of a more ancestral hominin and the flaking-oriented knapping of later, Oldowan toolmakers. 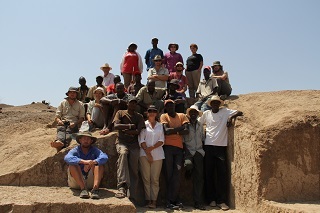 The WTAP team together at the excavation site in Kenya. “The site at Lomekwi provides an ideal window into early hominin behavior across an ancient landscape. The exposures of sedimentary strata there allow us to place these activities in a detailed environmental context, and to tightly constrain their age” notes geologist Craig Feibel of Rutgers University, a co-author on the study. The scientists dated the hominin remains by correlating the rock strata where they were discovered with well-known radiometrically dated tuffs (volcanic ash). The tools were studied by Dr. Harmand and her colleague Hélène Roche—world experts in lithic analysis, the study of stone artifacts from the various Stone Age periods in which they were made—to interpret physical features and reconstruct the manufacturing techniques used at the prehistoric site, including experimental replication of the tools. Drs. Harmand and Lewis co-directed the fieldwork and analysis of the findings as part of an international, multidisciplinary team of archaeologists, paleontologists, geologists, paleoanthropologists; there are 19 other co-authors on the paper. The Turkana Basin Institute is a privately funded, non-profit initiative founded by Richard Leakey and Stony Brook University, with a primary research focus on human prehistory and related earth and natural science studies. TBI provides permanent scientific facilities and logistical support to conduct fieldwork and research in the challenging remote environment of sub-Saharan Africa. It’s committed to safeguarding the extensive fossil deposits in the region through engagement with local communities, and works with the National Museums of Kenya in scientific institutional partnerships. Dr. Lewis wanted to be a paleoanthropologist working in East Africa since he was 13, when he read a book about the famous Lucy skeleton of Australopithecus afarensis. Dr. Harmand has always been impassioned about the quest for our origins, and the role of tools in cognitive evolution. She wanted to work in the Cradle of Humankind, where the first chapters of the human story are preserved.